If you are looking for a house plan on our Web site but are having a little trouble comprehending the details on how to read a floor plan from this article will be helpful. To assist you in understanding all of the details that are part of a floor plan including the type of ceiling, types of doors interior and exterior, such as pocket doors, patio doors, french and other garden doors, windows, fireplaces, wall thicknesses and many other details this useful guide will help you to discover the details. Another useful tool offered on the Web page of each plan on our Internet site is the “view room details” chart for which the link appears above each floor plan. By clicking on it you will reveal a list of many hidden dimensions including ceiling heights, bathroom, closet and pantry sizes and other measurements which do not appear on the floor plan itself. The floor plan above has been broken down to reveal the typical sections that you will find on many of our other house plans. 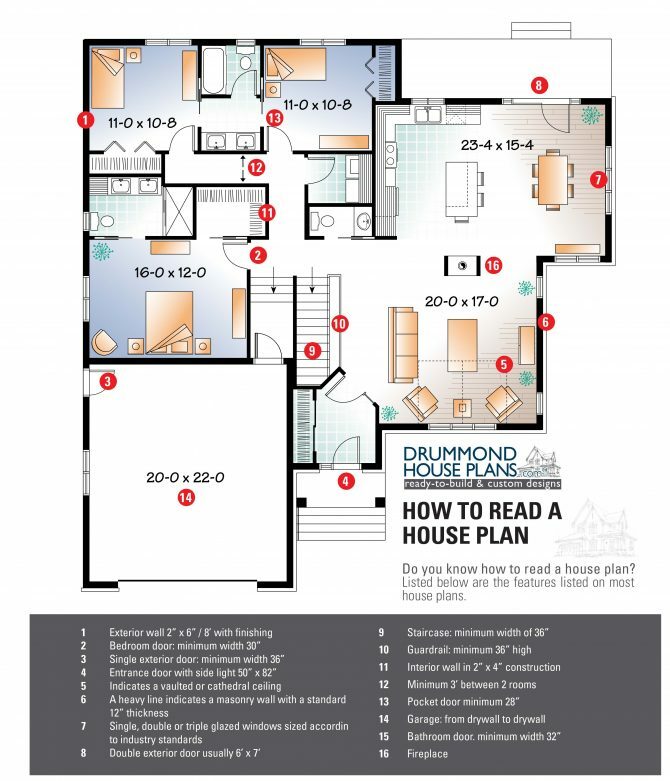 To better understand the elements and purpose of each it is important to understand the floor plan in order to visualize the home represented to be able to grasp its features. Among the useful features of our home and cottage plans, there is a dotted line on those plans with vaulted or cathedral ceilings to indicate the slope. Fireplaces are shown as well as the type of glazing on the windows (double or triple panes for example). All required door widths for the different openings are detailed on the house or cottage plan set that you will receive. Since, as they say, a picture is worth a thousand words the handy glossary above has easy reference numbers on an actual floor plan as seen on our site to help you visualize the home of your dreams!